Janes Island State Park encompasses 2,900 acres of Chesapeake Bay marsh, beach, and highland, and is bordered on the west by Tangier Sound. The park is dissected by many small waterways, with 30 miles of trails marked for canoes and kayaks. The park and the Tangier Sound region are the habitat for abundant waterfowl and other birds, as well as fish and shellfish populations. 9 a.m. to Sunset. Lifeguards are on duty 10 am. to 5 p.m., Memorial Day to Labor Day. Programming at the park's nature center provides visitors with a look at the human, cultural, and natural resource stories of the Eastern Shore's Tangier Sound. Activities include fishing, crabbing, flat water canoeing and kayaking trips, guided hunting and birdwatching, and camp fire programs. The beach area is only accessible by boat. The Janes Island State Park Water Trail map features six different trails, all of which begin and end at the Janes Island Park Marina and boat launch. For more information contact Janes Island State Park at 410-968-1565 or send an e-mail inquiry to [email protected]. Copies of this waterproof map can be obtained for $3 at the Janes Island State Park office. 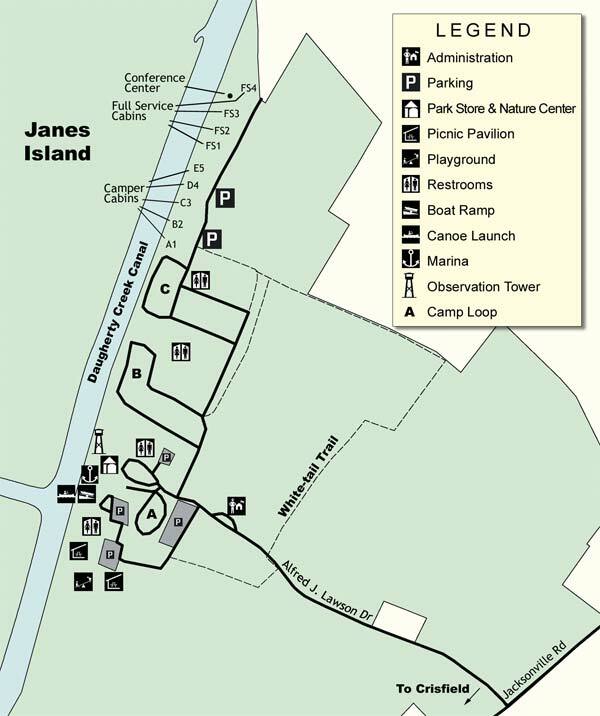 The Janes Island State Park Water Trail map features six different trails, all of which begin and end at the Janes Island Park Marina and boat launch. For more information contact Janes Island State Park at 410-968-1565 or send an e-mail inquiry to [email protected]. Copies of this waterproof map can be obtained for $3 at the Janes Island State Park office or by using the online order format. Janes Island State Park offers accessible restrooms, 4 full-service cabins which sleep six (these are available all year long), 5 camper cabins that sleep four, the conference center that sleeps 16 and is available all year for rental, 104 campsites--of which ten sites are pet-friendly, the Nature/Environmental Education Center, the fish cleaning table, dock area and the conference center. RV area with electric hook ups. Boat launch area and boat rental, large covered pavilions for group picnics. In the park the following are accessible: 4 full-service cabins which sleep six (these are available all year long), 5 camper cabins that sleep four, the conference center that sleeps 16 and is available all year for rental, 104 campsites—of which ten sites are pet-friendly, the Nature/Environmental Education Center, the fish cleaning table, dock area and the conference center. Pets are allowed in the day use area, on trails and on the island, but pets are prohibited in the cabins. At the time of Captain John Smith’s Chesapeake Bay voyages, the inhabitants of the land near present-day Janes Island State Park were American Indians of the Accohannock or Annemessex Nation. Their settlements likely consisted of houses scattered in fields and in groves of older trees, and they would have been difficult to see from the water. Because these communities were likely camouflaged from Smith’s view, and because he wanted to sail further up the Bay, Smith did not explore this area extensively.